Vancouver, B.C. 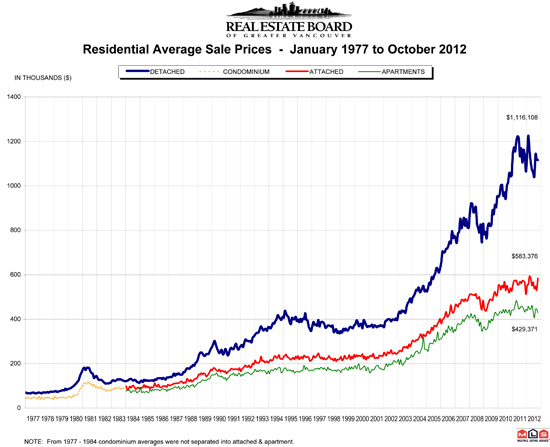 – November 2, 2012 – The Greater Vancouver housing market saw a slight increase in the number of home sales, a slight reduction in the number of listings, and a slight decrease in home prices in October compared to the summer months. With those changes, the sales-to-active-listings ratio increased to 11 percent in October from 8 percent in September. The Real Estate Board of Greater Vancouver (REBGV) reported 1,931 residential property sales of detached, attached and apartment properties on the region’s Multiple Listing Service® (MLS®) in October, a 16.7 percent decline compared to the 2,317 sales in October 2011 and a 27.4 percent increase compared to the 1,516 home sales in September 2012. October sales were 28.5 percent below the 10-year October sales average of 2,700. New listings for detached, attached and apartment properties in Greater Vancouver totalled 4,323 in October. This represents a 1.2 percent decline compared to October 2011 when 4,374 properties were listed for sale on the MLS® and an 18.8 percent decline compared to the 5,321 new listings in September 2012. At 17,370, the total number of residential property listings on the MLS® increased 12 percent from this time last year and declined 5.3 percent compared to September 2012. Since reaching a peak of $625,100 in May, the MLS Home Price Index® (MLS HPI®) composite benchmark price for all residential properties in Greater Vancouver declined 3.4 percent to $603,800 in October. This represents a 0.8 percent decline compared to last year. Since hitting a record high in April, the benchmark price of a detached home on the Westside of Vancouver has declined 8.6 percent while detached homes in Richmond and West Vancouver have seen declines of 6 percent over the same time period. Sales of detached properties in Greater Vancouver reached 790 in October, a decrease of 18.9 percent from the 974 detached sales recorded in October 2011, and a 19.1 percent decrease from the 976 units sold in October 2010. Since reaching a peak in May, the benchmark price for a detached property in Greater Vancouver has declined 4.1 percent to $927,500. Sales of apartment properties reached 803 in October 2012, a 16.2 percent decrease compared to the 958 sales in October 2011, and a decrease of 18.4 percent compared to the 984 sales in October 2010. Since reaching a peak in May, the benchmark price for an apartment property in Greater Vancouver has declined 2.9 percent to $368,800. Attached property sales in October 2012 totalled 338, an 11.5 percent decrease compared to the 382 sales in October 2011, and a 10.3 per cent decrease from the 377 attached properties sold in October 2010. Since reaching a peak in April, the benchmark price for an attached property in Greater Vancouver has declined 2.9 percent to $457,700.